Err, this isn’t exactly a breaking news story, but I came across a photo and post on Flickr recently that shed a little light on the inner workings of the world of tech, and though the gender imbalance in technology may be something chronic, it seems that women who do work there don’t do too badly in some respects. And, yes, I mean in respect to getting free tampons. Free Tampons @ Microsoft, Yahoo, Apple & IBM. No Free Tampons @ Google (but you do get snacks). I second that comment. 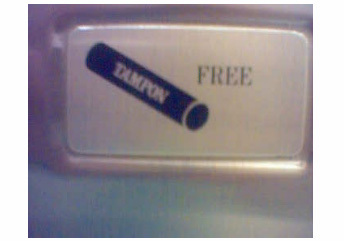 I have definitely seen the free tampon / pad machines in the ladies rooms on the Mountain View Google campus.